Today I watched a TED talk of Linus Torvalds, Linus took a snippet of code to explain the problem of taste of code. The deleted node is not the head of the list, now it just need to link the previous node to the next node. Different from the first snippet of code, this snippet of code doesn’t have that if statement. Here we copy the address of next node to the next pointer of the previous node by using a pointer of pointer indirect. Let’s take a closer look at the code. Here is the definition of linked_list, nothing special. Suppose we have 5 nodes (1/2/3/4/5) in the linked list, head is pointing to first node and we want to delete second node. linked_list** indirect = &head; this line will create a pointer of pointer points to head. First indirect points to head, *indirect is equivalent to head, which points to the first node. Apprently, (*indirect) != entry at first, so the while loop continues. In indirect = &(*indirect)->next, if we are familiar with C Operator Precedence, we know that the precedence of -> is high than that of &, so this line is to get the address of the next pointer. In the last line, since *indirect is pointing to the address of the next pointer of the first node, *indirect = entry->next; will rewrite the next pointer of the first node with the address of the third node, and it’s done, the second node is not a part of the list any more. 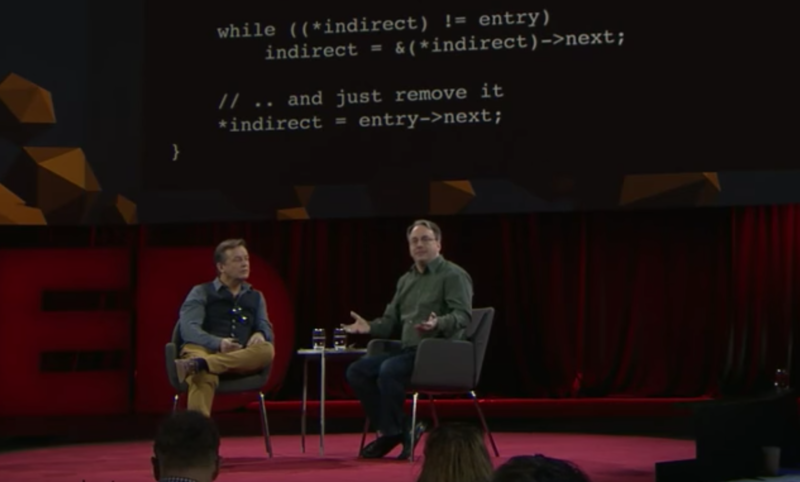 My point is, it is really interesting to watch Linus Torvalds to show this snippet of code, because it remind us of refining our code consistently and don’t take the code we have learned in the school as the dogma.